Beans vs. Cornbread » One arm, one game, no long boxes and lots of tapes. One arm, one game, no long boxes and lots of tapes. First of all, I just finished watching a movie that I’ve wanted to see for about 15 years now. 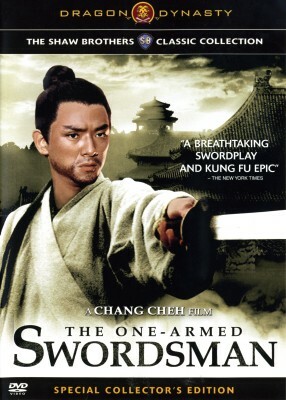 From Shaw Studios comes the One-Armed Swordsman starring Jimmy Wang Yu and directed by legendary Chang Cheh. I’ll devote a whole post to this movie at one point, but I just want to say that everyone involved with this ‘Dragon Dynasty’ version of bringing over Celestial’s HK remasters deserve a pat on the back. Not only do you get the movie, a Chang Cheh documentary featurette, a Jimmy Wang Yu interview and 2 trailers for the movie and long trailers for other Shaw Bros. movies (trailers that are better than some whole movies), you get a $3 coupon for another title in the series. An added bonus for me is finally seeing the words “Shaw Scope” correctly centered. Needless to say, I’ll have to make a snapshot of that. Only picked up two comics: the All-New Flash #13 and the Brave and the Bold #4. Enjoyed both, but I have to admit that I’m glad that they’re going back to the old Flash numbering with new Flash flavor. Finally got the last two short boxes that I need to replace the long ones so it’ll be easier to store my comics. Bad side: I have so many Flash comics that they’re now separated into two short boxes. Dammit. With Mark Waid returning to write the Flash, I’ll have to buy another short box. Rolled with Raijin and Melinda to Splitstone Video only to be ambushed by a big sale. They had hundreds of VHS tapes for ten cents each. I’m trying to avoid VHS due to space/pack rat issues, but they had tapes that I had to get. Example: Thompson’s Last Run starring Robert Mitchum and Wilford Brimley. How the hell do you pass that up? It’s simple: you don’t. All in all, 16 tapes with 4 being gifts for other people. Picked up a used copy of the PS2 Van Helsing game for my mother only to find out that she has it already. Then we hit newly opened GameStop and I got a used copy of Mortal Kombat: Shaolin Monks, a game that I only heard good things about long after it wasn’t in stores around here. Of course, they also had Taito Legends 2, the first time I’ve seen that GameStop exclusvie in one of their actual stores.